Few things in childhood are more traumatising than waking up one morning to find your beloved pet fish, Michael Scofield, floating upside down in his tank (true story); his tiny fishy light cruelly extinguished before his time. But why do they float upside down when they decide it’s time to take a ride on the porcelain express? The answer to this question has a lot to do with how they maintain proper buoyancy when they’re alive. As you may or may not know, most fish are in possession of an organ commonly known as a “swim bladder”. This organ can be filled or emptied of air by a fish at will via its gills, allowing them to either float higher, sink lower or stay suspended at about the same depth, not unlike a Buoyancy Compensator (BC) used by scuba-divers. Although swim bladders are critical to a fish’s ability to float, sink or hover without expending much energy, they have the unfortunate side effect of making them rather unstable. To explain, research has shown that the relative position of a fish’s “centre of buoyancy” is, amongst fish with swim bladders, almost universal located below their centre of mass near their stomach, making them quite prone to hydrostatic rolling which is just a fancy way of saying it makes them more likely to go belly up. This is why fish can often be seen flapping their fins, even when they’re not moving and in perfectly still water. This is also why when fish become ill or injured, they will sometimes begin swimming on their side or even upside down; they simply lose the ability to maintain hydrostatic equilibrium and the more buoyant part of their body will try to float to the surface. When fish ultimately die, of course, they lose all ability to stop themselves rolling over and the buoyancy of the swim bladder takes over. It should also be noted that fish don’t necessarily always float when they die. For example, if a fish dies with little to no air in its swim bladder, the act of dying doesn’t magically make this bladder expand to increase buoyancy. In these cases, the fish will often sink, at which point decomposition will begin. 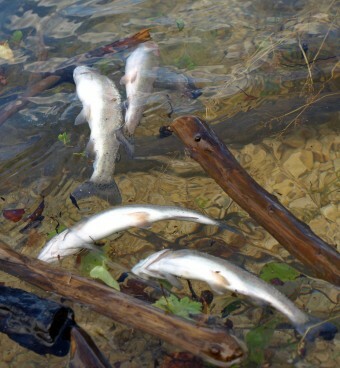 That said, the decomposition process can sometimes result in enough gas being produced and trapped inside the fish to cause it to float to the surface. So in short, fish float upside when they die because many of them are top heavy and posses and organ in their lower region that is filled with air. Why is “Z” Pronounced “Zed” in Some Parts of the World and “Zee” in Others? While it’s entirely within the realm of possibility for a goldfish to live for 3 decades, this is, rather sadly, almost never the case. Although, given that goldfish are extremely intelligent fish, contrary to popular belief, and people often just put them in a little glass bowl with no real way for them to entertain themselves or be mentally stimulated, perhaps not living for three decades in such an environment is preferable. Swim bladders are by no means a universal trait all fish share. For instance, neither sharks nor rays possess the organ, the latter due to their mostly bottom dwelling nature. Sharks do have a large liver that is filled with a lighter-than-water oil, making them naturally somewhat more buoyant than they’d otherwise be. Not having a swim bladder is also an advantage for sharks in that swim bladders can rupture if the fish ascends too quickly, which is probably another reason sharks, which rely on moving quickly to hunt and survive, didn’t evolve to have them or evolved away the trait. If you’re wondering, I called my fish Michael Scofield because my parents insisted that I give my fish a name other than”Fish”. Prison Break was big at the time, so I named the fish after the main character who is also called “Fish” in early episodes. I currently have a pet fish named Michael Scofield the Fourth, who is much loved. Sharks Must Swim Constantly or They Die! Loved the information, wrapped in the humour, and strong views about goldfish in bowls.